The Environmental Protection Agency’s (EPA) science advisory panel tasked with reviewing ozone regulations is stacked with experts who have collectively received millions in agency funding over the years. 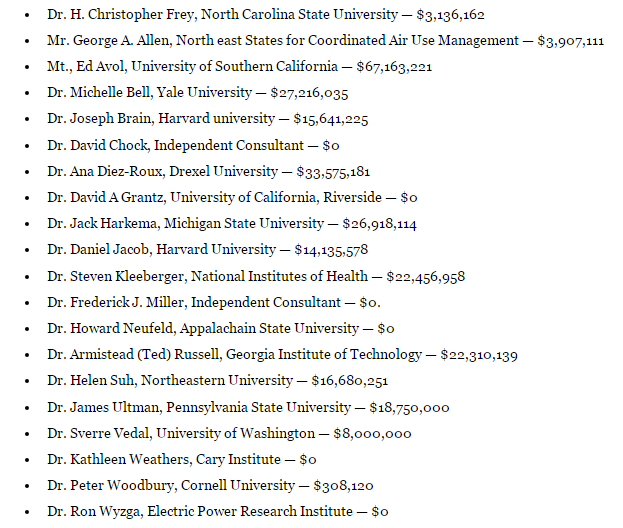 Of the 20 scientific advisers sitting on EPA’s Clean Air Scientific Advisory Committee (CASAC) Ozone Panel, 17 have received a total of $192 million in EPA grants, according to an analysis by the blog JunkScience.com. This news only fuels the argument that EPA’s science committees aren’t “independent” as required by federal law, because they are stacked with experts who rely on the very agency they are overseeing for money. “The EPA’s CASAC panels work on a consensus basis,” wrote Steve Milloy, the publisher of JunkScience.com and senior fellow at the Energy & Environment Legal Institute (EELI). “So with 70% of panel members on the receiving end of $192 million in grants, a ‘consensus’ supporting the EPA was not difficult to achieve,” Milloy wrote. Milloy, who has been battling EPA and environmentalists for years over the quality of science used to promulgate clean air regulations, recently sued EPA over the integrity of its science panel tasked with reviewing regulations for fine particulate matter, or PM2.5. Milloy found EPA’s PM2.5 panel was also primarily made up of expert advisers who benefitted from EPA funding. EELI released a report that 24 of the 26 members of the PM2.5 got more than $190 million from the agency. Most of these experts were hand-picked by EPA to review federal regulations. EPA also said CASAC members’ financial statements were exempt from Freedom of Information Act requests under the rather ironically named Ethics in Government Act. EPA relies on CASAC scientific advisers to validate the science underlying key clean air regulations pushed by the agency. There are many panels, but Milloy and EELI have focused on those reviewing ozone and PM2.5 regulations — these are some of the most economically impactful rules the agency puts out. “It’s a remarkable denial since it’s been already determined from publicly available documents that the 24 of the CASAC PM Panel members have received over $190 million in grants,” Milloy wrote on JunkScience.com. “So is the embarrassing part that none of the CASAC PM Panel members disclosed these grants as financial conflicts of interest? Might those failures be crimes?” Milloy wrote.